Evolution of the differential absorbance (At – At=0) of C2H2 as a function of the irradiation duration at 355 nm. The left panel presents results for acetylene coated on blank sapphire window. 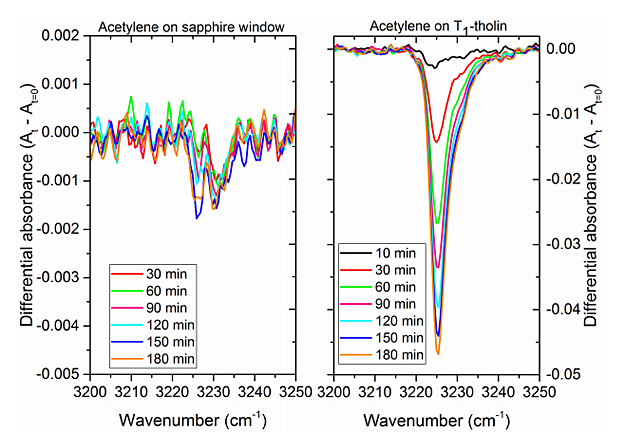 The right panel presents results for acetylene coated on a T1-tholin sample. As solar photons penetrate through Titan's atmosphere, shorter-wavelength photons are attenuated and longerwavelength photons make it into the lower altitudes, where aerosols become abundant. We conducted an experimental study to evaluate the long wavelength ( > 300 nm) photo-reactivity of these ices accreted on the Titan aerosol-analogs (also known as tholins) made in the laboratory. We have focused on acetylene, the third most abundant hydrocarbon in Titan s atmosphere after CH4 and C2H6. Further, acetylene is the most abundant unsaturated hydrocarbon in Titan s atmosphere. Our results indicate that the aerosols can act as activation centers to drive the photoreactivity of acetylene with the aerosols at the accretion interface at wavelengths where acetylene-ice alone does not show photoreactivity. We found that along with photochemistry, photodesorption plays an important role. We observed that about 15% of the initial acetylene is photodesorbed, with a photodesorption rate of (2.1 +/- 0.2) x 10-6 molecules.photon-1 at 355 nm. This photodesorption is wavelength-dependent, confirming that it is mediated by the UV absorption of the aerosol analogues, similar to photochemistry. We conclude that the UV-Vis properties of aerosols would determine how they evolve further in Titan's atmosphere and on the surface through photochemical alterations involving longer wavelength photons.